Thursday, December 17, 1981—finished fixing the truck, shopped and went to Nelchina, unloaded supplies, then to Tazlina and unloaded more. Lost a hundred pound propane tank. Stopped to ask Blake to feed the dogs and pack for the trip to Minnesota. Friday, December 18, 1981—picked Darrel up and started out at 12:30 a.m. Arrived at Hanes Junction late in the morning. Whitehorse, we had supper, Watson Lake, we got there at midnight. The roads are snow covered and ice under the snow. Saturday, December 19, 1981—we arrived at Dawson Creek at 6:30 p.m. and ate supper. The roads are very bad. Darrel took turns driving my pickup. Sylvia sits in between us. It’s not comfortable sitting in the middle, this truck has a gear shift, it’s not automatic—but she’s not complaining. 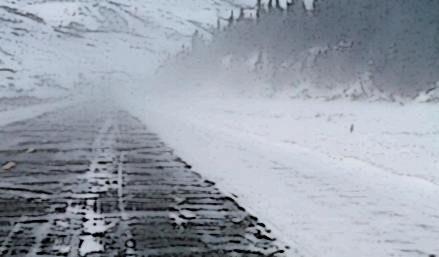 Sunday, December 20, 1981—at 6:00 a.m. in Edmonton, the roads are very bad and it’s blowing snow. It’s tiring to drive. Monday, December 21, 1981—we got to Saskatoon at noon. The roads are still bad and blowing snow. We kept on going and ate supper in Winnipeg. Tuesday, December 22, 1981—Arrived in Fargo at 5:00 a.m., dropped Daryl off at the bus station where he met a friend to drive him to South Dakota. We went on to Motley and then to Cushing and stopped at the real estate agent, then to Little Falls to sign the sale papers for the west 80, then to Minneapolis to Darrell and Nadia’s. The kids came over to visit us. I slept a lot, trying to catch up. Thursday, December 24, 1981—here at Nadia’s, lots of visitors. Visited Kevin’s relatives in the evening. Friday, December 25, 1981—nice Christmas day with the kids and friends. Saturday, December 26, 1981—it was snowing, we went out shopping and then we went out again for supper. Sunday, December 27, 1981—went over to Beverly’s for supper and a movie. Monday, December 28, 1981—went to the farm and visited some people and got some things that we had in storage over at the chicken house on the east farm. Got back to Nadia’s late. Tuesday, December 29, 1981—did some shopping and visited Beverly, Kevin and Vanessa. Wednesday, December 30, 1981—we did more shopping and played with Vanessa and it’s snowing and warm. We have plans to go to Theresa’s for supper this evening. Had Minnesota venison for supper and a good time. Thursday, December 31, 1981—had goose for dinner and a nice visit all day. Went to Paul and Ruth’s in the evening. Friday, January 1, 1982—visited with Paul, Ruth and Steve all day and had a good time. Saturday, January 2, 1982—went to Nadia’s. Darrell helped me get loaded and ready for the trip back to Alaska. We left there and went to the farm, and then from the farm, we drove to Fargo, North Dakota. The roads were snowy and icy. We got there at 9:30 p.m. and waited for Darrel to arrive. Soon, Darrel, Larry and Doug arrived at 12:30 a.m. We all visited for a while and then we left for Alaska. Sunday, January 3, 1982—still traveling. Roads are better though, but it’s cold. It was -40° . More of the same, shopped in Fort Nelson—more cold. Monday, January 4, 1982—when I we got to Watson Lake today, it was -56°. No one was shutting off their vehicles if they expected to drive them. Our truck is stiff, mechanically. For instance, the brake and the clutch feel strange when you use them. The doors on the truck have shrunk up and they rattle. The cold air blows in; the heater barely keeps it so we can stay in it. Tuesday, January 5, 1982—blowing snow and icy roads and very cold. We had a detour from Jake’s, Corner to Carcross and then to White Horse. We did a little shopping and then had ice fog and snow and high winds and more cold all the way to the border. A distance before the border, in the night, Darrel was driving and I saw vehicle tracks that appeared to me that they went over in the other lane of the highway and gone off into the ditch. So I asked Darrel to turn around and go back so we could look to see if there was somebody in the ditch. We got back to this place and I got out and walked around and I had a flashlight. I could see where this vehicle had left its lane and left the highway, over the end of a culvert and into the ditch, over on its top and gear and cans of fuel and lots of stuff was lying around in the snow. The vehicle was destroyed; it’s a brand new Ford ¾ ton pickup. I walked the perimeter looking for tracks of anyone who might have been stunned and walked or maybe wandered out on the snow and brush—I found no tracks out there. We hadn’t seen a vehicle in hours. Those folks must have been really lucky that someone came along and picked them up—of course we’ll never know what happened to them. Wednesday, January 6, 1982—we arrived home about 7:00 a.m. and rested all day. The temperatures here at home are running -40° to -55°. Thursday, January 7, 1982—got up late and it’s still -55°. Friday, January 8, 1982—unloaded part of the pickup, visited Jackie—Blake wasn’t home. Had supper with Bob and Margaret Schmidt. Saturday, January 9, 1982—went to Glennallen grocery shopping. Mike P. and Ken K. stopped in and brought Judy back and told us of a dead moose along the highway east of us. We called it in to fish and game and they came out and looked at it and said I could have it for dog food. Henry pulled it home with his wrecker. That really worked well. He could winch it out to the road, and pulled it right down the highway into the lodge parking lot. When I butchered this moose, I found it was pregnant. Monday, January 11, 1982—put a handle in an ax and visited with Sam. Tuesday, January 12, 1982—cut quarters off moose with an ax. Dan Billman stopped by and we had a visit. Wednesday, January 13, 1982—pulled two quarters of the moose to a place where I would be cooking it for the dogs. Lee Dudley and Darrel G. came to the lodge and we played cards and dice games and visited. We have a game called Ship Captain & Crew….We all like to play that. This entry was posted in Journal Entry and tagged Christmas in Minnesota, driving Alaska Highway in December and January, icy roads, sub zero temperatures. Bookmark the permalink.